If you told me a week ago that a recipe for healthy brownies existed, I would’ve told you were crazy. Kristen and I LOVE brownies, but we are well aware of how terrible they are for you. We accept brownies as they are- delicious, but flawed (read: caloric). If only all of our relationships were so simple! I mean, how do you even attempt making a chocolate baked good that’s not bad for you? In our opinion, brownies are among the best desserts known to man- chocolatey, fudgy… but healthy? Not so much. Given that brownies are one of our biggest vices (you hadn’t already guessed that? 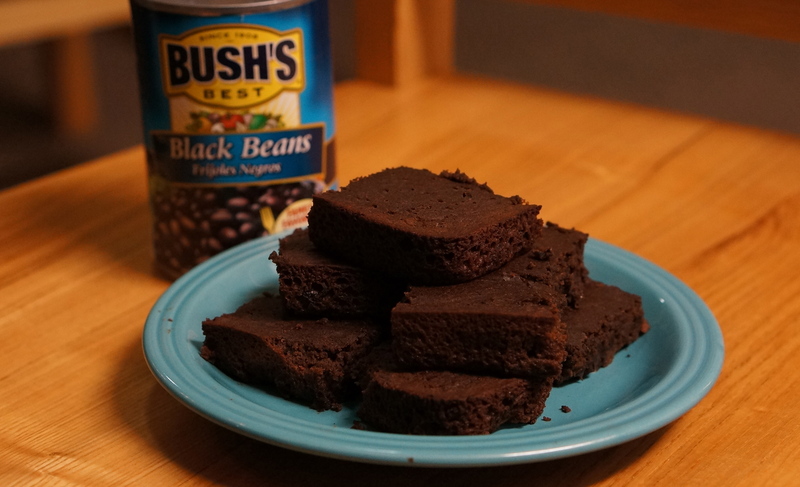 ), when we found a healthy black bean brownie recipe from Inner Workings of a Foodie, we immediately knew we had to call shenanigans. According to the recipe, these brownies would come out tasting just like normal brownies, minus a few calories. Our doubts were pretty set- smooshed up black beans mixed some chocolate just doesn’t sound appetizing. That being said, we decided to give them a whirl for brownie lovers everywhere, plus do a side-by-side nutrition comparison with your average brownies. 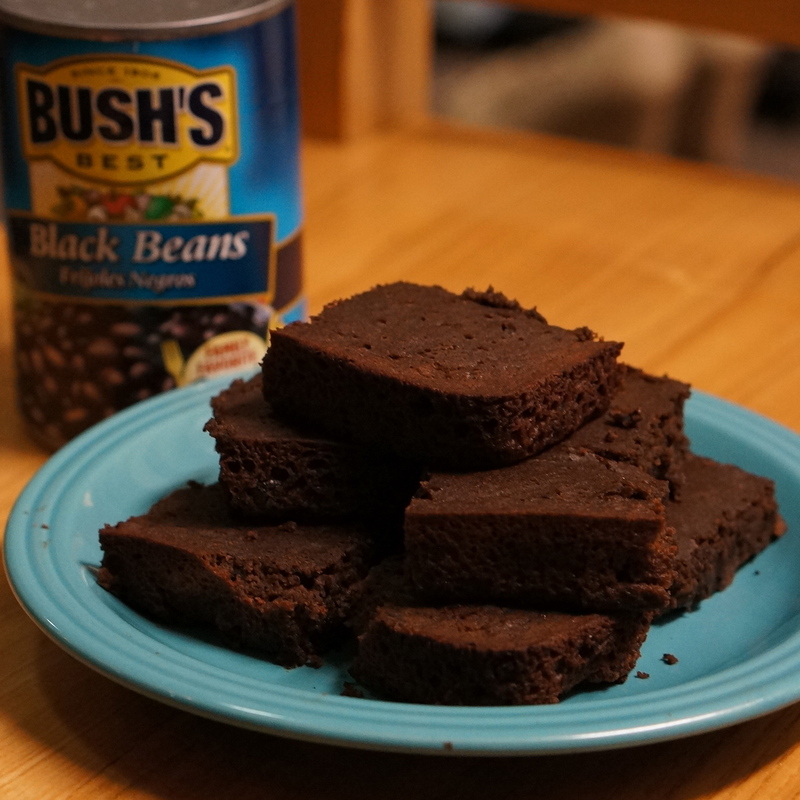 Here’s how we made these black bean brownies. 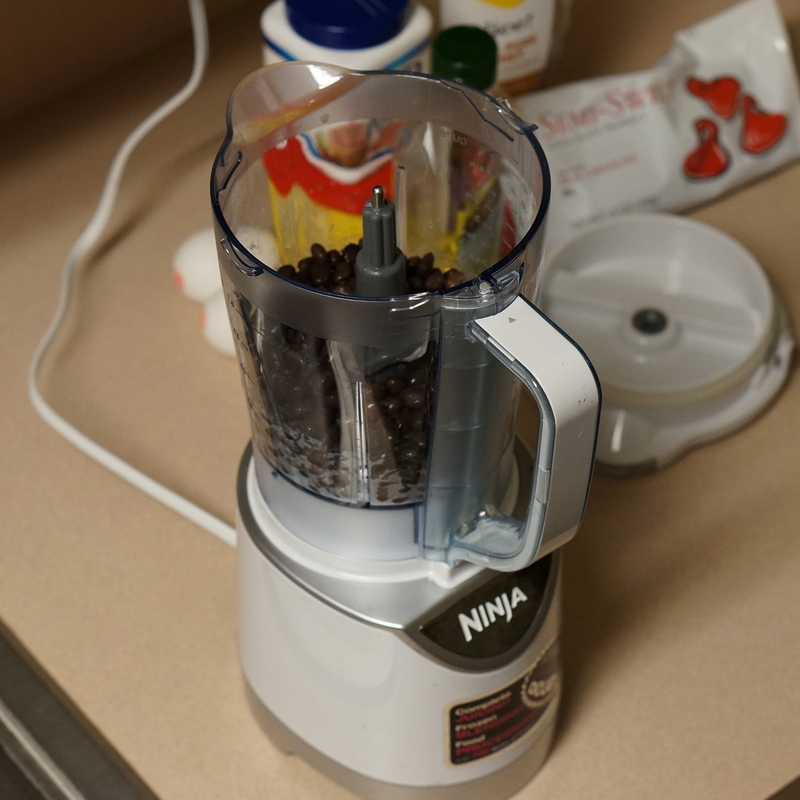 After you’ve drained and rinsed your black beans, blend them using a food processor (or blender) until there are no chunks left. You may need to use a spoon to smush the last few stubborn beans. Move the beans to a big bowl. Now you’ll add the wet ingredients. Pour the olive oil in first and mix, then add the egg whites and honey. 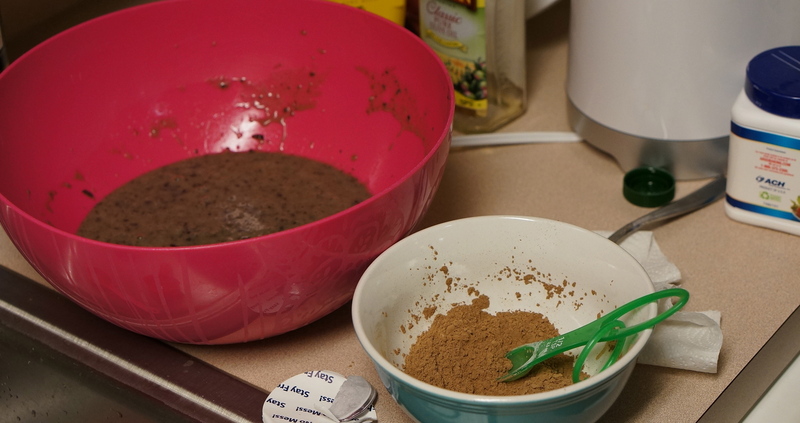 Blend the dry cocoa powder, baking powder and salt in a small bowl. Add this dry mixture to the batter and mix. Last, pour in the chocolate chips and blend well. 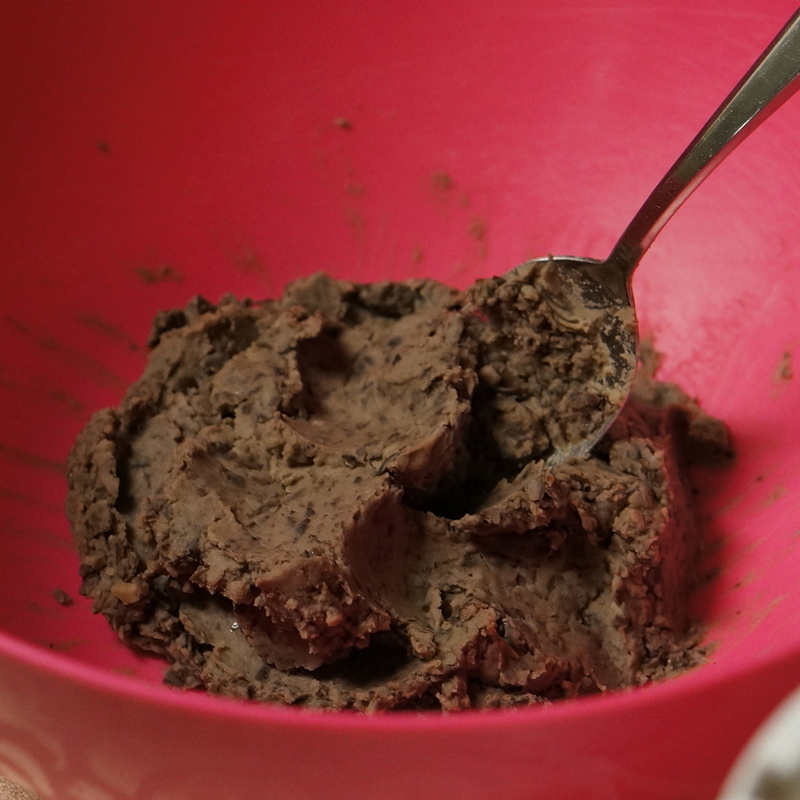 Spray an 8×8 pan with nonstick spray and pour in your brownie batter. 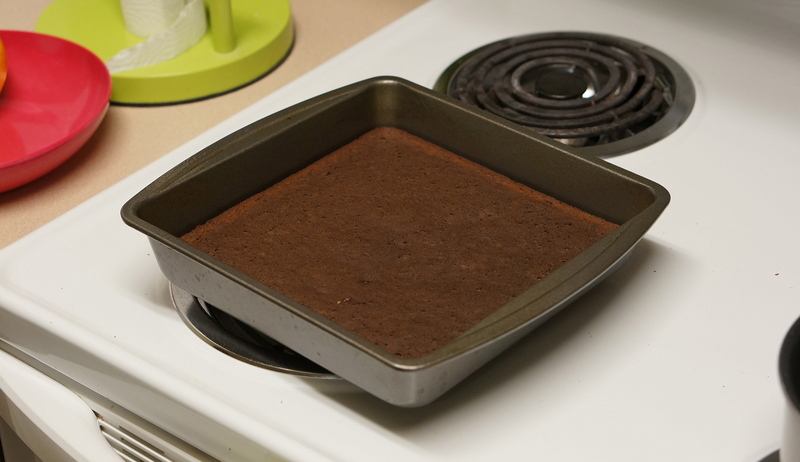 Bake the brownies in a 350 degree oven for about 23 minutes, or until the top feels firm. You’re all done! Wait for the brownies to cool and have at it! Be warned: the brownies are a bit harder to cut and serve than normal brownies because they come out very moist. Refrigerate any leftovers and eat within two days. Drumroll please… How did they turn out? The brownies actually came out really well! Don’t worry- we were surprised too. The texture wasn’t exactly like regular brownies, but overall they were delicious! They were really moist and fell apart pretty easily, so expect to get a little messy. We found that they tasted better once they had cooled as opposed to hot from the oven. They would definitely satisfy a chocolate craving, and they were good enough to impress these brownie connoisseurs! We know that these brownies taste good, but how do they stack up nutritionally when compared to regular brownies? To find the answer, we compared the calories, fat, fiber, protein and carbs in our black bean brownies and Betty Crocker Fudge Brownies. The nutrition facts listed are for 1/16 of an 8×8 pan of brownies. Try some of our other healthy shenanigans below! Finally a brownie that isn’t all that bad for you! Can’t wait to try them, what a great find Shenanigans! And half the calories, carbs, and fat. Awesome!! Yea! Let us know how yours turn out if you try them! I’m intrigued! I think I wanna try making some. I’m trying to eat healthier and work out more and sometimes you just want something sweet. I have a major sweet tooth, so I think I’m gonna try and see if this will satisfy! If so, I’m gonna trick my hubby and see if he approves! I made these tonight with Agave Nectar instead of honey and was a little skeptical because when I tasted the batter it tasted exactly like black beans. But it turned out really good actually. Just not as sweet as I was expecting. I am going to try these; but replace the oil with an equal measure of unsweetened apple sauce. I started using apple sauce, pumpkin, banana or black beans as a replacement for oil after my hubby had a stroke. Everything has turned out moist and tasty, never had anyone recognize the switch. I also substitute Egg Beaters for eggs. I made these last night!! They were great, what a treat!!! My friends all wanted the recipe!! Thanks Shenanigans. THANKS AGAIN FOR ANOTHER WONDERFUL RECIPE!